Are you unhappy with your crooked or crowded teeth but hoping to avoid conventional orthodontic treatments? For people who want to benefit from straighter teeth and a more beautiful smile without wearing metal braces for a year or more, Invisalign offers a wonderful alternative. Invisalign uses a series of clear plastic aligners to gradually shift misaligned teeth into the proper position. 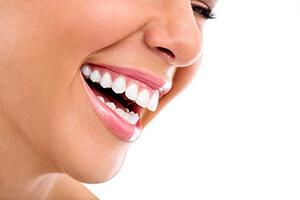 These aligners are customized to fit tightly around the teeth at each stage of the treatment. You will be instructed to wear each set for 20 to 22 hours each day, removing them to eat, drink anything other than water, and to brush and floss your teeth. 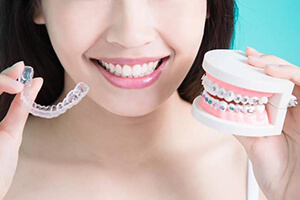 You will advance to the next set of aligners in the series after 1 to 2 weeks, depending on our recommendation. We will schedule a check-in appointment approximately every 6 weeks. The average treatment time for Invisalign ranges between 1 and 2 years, depending on the complexity of the case and how well the patient complies with the instructions. Invisalign is practically invisible when worn. Removable Invisalign aligners allow you to continue to eat what you like throughout the treatment, without worrying about popping off a bracket or wire. Because you can brush and floss your teeth without having to maneuver around fixed brackets and wires, your oral health stays strong throughout the treatment. Smooth plastic trays are typically far more comfortable than metal hardware. Fewer visits to the dentist are required with Invisalign compared to conventional braces. At the end of the treatment, you can enjoy a beautiful smile with straight teeth and a properly-aligned bite! The only way to find out for sure whether or not you can benefit from this clear aligner system is to schedule an appointment with our office. When you do, Dr. Bradley Mitchell will evaluate the alignment of your bite, discuss your smile goals, and determine which method of treatment is best for you. If it’s Invisalign, you can look forward to getting started right away. To learn more about Invisalign or to schedule an orthodontic consultation, we invite you to get in touch with Mitchell Smile Design today. We can’t wait to help you enjoy all the benefits of straighter, more beautiful teeth that function properly for life. Request an appointment with our team today!